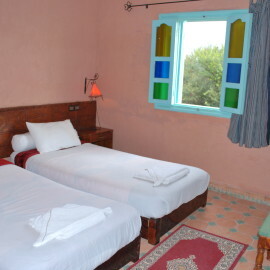 A guest farm with a majestic swimming pool At the heart of Souss and its forest of argan trees ('biosphere reserve' of UNESCO since 1998) only 30 minutes from Agadir and Taroudant in the heart of a farm of 8 hectares Located at the crossroads of the Atlas mountains and the Atlantic Ocean, Gite Souss is a haven of peace for nature lovers.and for those looking for a change of scenery.Se 12 air-conditioned rooms have a screen TV Flat-screen TV and a private bathroom with a shower. 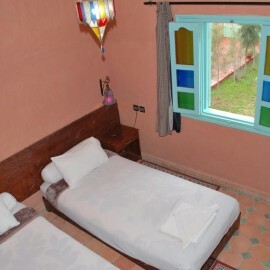 The subtlety and the discretion of the Gite Souss make their sense thanks to the warm welcome of the hosts. The main patio, living room with fireplace, terraces, multipurpose room, dining room ensure you a pleasant setting for a peaceful stay.Els remain an extra on request from guests, we offer a variety of animation troops folk, Games of animations, festivities for your birthdays. All children are welcome. One child under 2 years stays free of charge in a baby cot. The educational farm has free access is a distraction and an education to the environment for your children . A 24-hour reception, free covered parking (without prior reservation). 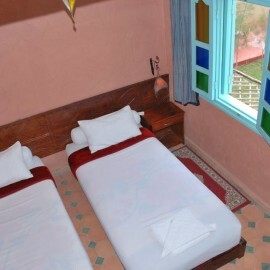 , A tourist information and documentation office are at your disposal.Pets are allowed at no extra charge. 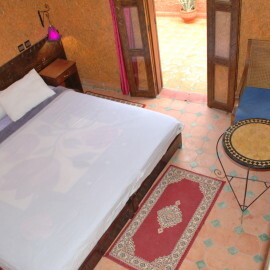 We are all here to help you choose your stay in Agadir and help you during your holiday. 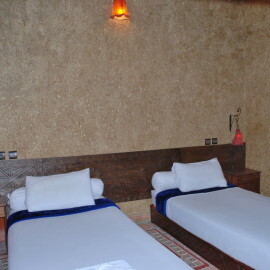 Booking a holiday stay in Agadir involves the management of food and drink by us. Let you do: your private cook offers delicious meals.